Dr. Jason Speidel was born and raised in Ohio and attended the University of Dayton where he earned a bachelor’s degree in political science. Following this, he spent time working for the United States Senate before turning his eyes toward a career in veterinary medicine. 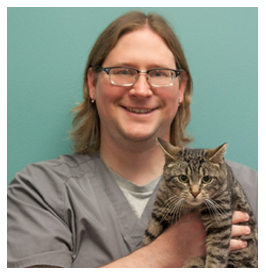 In 2010, he earned his DVM from Ohio State University. While still a proud Buckeye alumnus, he hasn’t looked back since relocating to the Irish Hills area of Michigan, and has come to enjoy the ribbing received from both his Wolverine and Spartan friends. When not in clinic, Dr. Speidel is a barbecue and home brewing enthusiast, or you might find him outside trying to keep up with his wife and daughters on the many local hiking trails and waterways. Of course no one in the veterinary profession is complete without some pets around; rounding out the household are two cats, a dog, and a pair of rats.